Business owners can use a variety of different techniques and marketing strategies for attracting attention and gaining subscribers to their businesses. 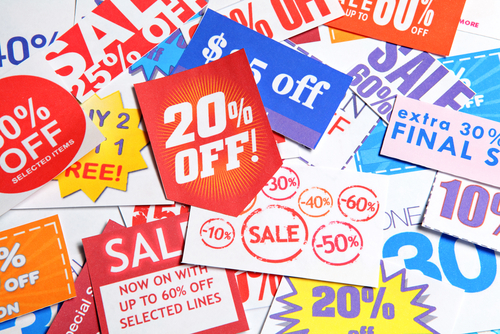 One of the most common techniques used today is to offer a discount. On the surface, it certainly seems as though offering a discount would be a great way to accomplish your marketing goals. It certainly attracts attention, given that everyone loves to save money. Beyond saving money, people also typically enjoy being treated as special and feeling as though they have gained a bargain. This is part of the thrill that is associated with online shopping. Even so, there can be a significant disadvantage to offering frequent discounts and it is that you could be ripping yourself off. While larger companies may be able to offer frequent discounts without incurring any damage to their bottom line, that is not always the case with a small business trying to establish a solid network. If you are going to utilize discounts, it is important to make sure that you do it in the best and most cost-effective manner. Perhaps one of the biggest mistakes that small business owners make when it comes to implementing a discount strategy is not using it at the right time. Prior to offering discounts, it is important to carefully think about your reasons for deploying that tactic. For instance, are you providing discounts because customers have demanded it? Have you noticed that clients have left your company for a cheaper competitor? Are you concerned that customers might reject your company if you price your products or services for what they are really worth? Discounts should never be provided simply because a customer has asked for it. If a customer is demanding a discount, he or she has become too comfortable, or they are simply shopping around for the lowest price and do not truly value your products or services. Generally speaking, discounts should only be provided as a way to express appreciation and should not be utilized to actually retain customers. Additionally, it is important to ensure that you only offer discounts to a select group of customers. It can be risky to announce a general discount plan. Once you have done so, it can be difficult to return to normal prices or change your mind because you see that your bottom line is suffering as a result. To avoid such problems, never apply a general discount, particularly when it comes to new customers. Discounts should only be provided to a few select customers who meet certain standards, such as making punctual payments, loyalty, and the number of quality clients they have referred to you. Implementing a discount strategy can be risky unless you have established a sufficiently solid base of customers to ensure that your monthly revenue goals are covered. You must be measured in your approach and ensure that your bottom line can actually sustain a discount before you offer it. There is no doubt that it can certainly sound like a good idea to offer discounts from the beginning as a way to attracting customers. However, in the end, you could find that your revenue suffers if you are not able to acquire enough sales to cover the discounts that you offer. Using coupon or discount sign-ups on your site can be a great way to boost your subscriber list. Many people will quite happily offer up their email address in order to obtain a coupon code. This method can be particularly effective when used with pop-ups. With this method, you also gain the added benefit of being able to run an auto-responder series or even add these contacts to your email newsletter for the purposes of follow-up marketing. However, keep in mind that when you are making this type of offer, the customer is usually ready to make a purchase right then. Leverage that readiness to buy by setting an expiration date on the discount. Additionally, make sure that there are conditions and limitations that apply to the discount you offer. For instance, ensure that the discount can only be used on a one-time purchase. Deferred discounts can be another great way to bring in subscribers, but you need to handle it in the proper manner. For instance, you might offer a discount on the customer’s next purchase, thus helping to ensure repeat business while also minimizing the effect on your profit. You might also consider offering non-traditional discounts. There is nothing written in stone stating that a discount must be a percentage off a purchase. For instance, instead of offering “cash” discounts, you could instead offer a discount that gives subscribers access to a free report or other type of service. Make sure that whatever you choose to offer does represent something truly of value to the customer. Offering discounts with other offers can be an effective way to show your appreciation to clients while ensuring that your bottom line does not suffer in the process. For instance, you could offer some small extra service to select groups of clients. The key to making this technique work is to ensure that what you offer is something that would be desirable to your customers. Possible ideas include an informative newsletter, advance notice of future sales, or an upgraded product or service. Ideally, what you offer should not cut into your profit margin. By using a little imagination and creativity, such perks can actually go a long way toward improving customer satisfaction without hurting your business. If you would like to offer a discount as well, you might consider reducing the actual percentage of the discount and adding in one of the features listed above. If you have tried everything else and feel that offering a discount is the only viable solution for boosting your business, then go ahead and offer a discount, but keep it small and only offer it for long-term projects. This method can help you to successfully attract customers by providing them with an appreciation discount for future work, such as if they make another purchase or provide a referral that results in a paying customer. Discounting can be efficient when it is used under the proper circumstances. With that said, if you resort to using discounts too frequently or in the wrong manner, you actually begin to devalue your products and services and will soon begin to experience lower profit margins.